Is this not just the happiest canvas? Designed by our own Shelly Penko in a totally new style. It’s going to be a super fun stitch! Join us for a three-day extravaganza in April. I’m writing a stitch guide. The elves are stitching for us in the wings and they are having a grand time! We will spend three days stitching together and having fun. You know there will be beads. I can feel it. I’m also feeling overdyes and sparkly threads. So many fun things…. Class dates are 11-5 Friday, Saturday and Sunday, April 20-22nd. Canvas is 10″ x 10″ handpainted on 18ct. Class fee is $365 plus canvas ($220), stretcher bars, threads and embellishments. 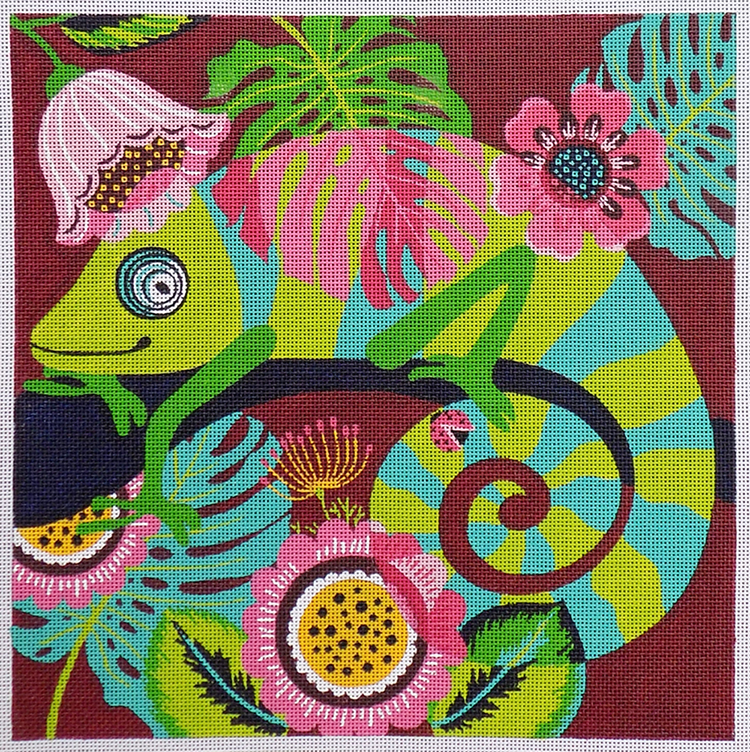 We are also happy to kit the happy chameleon and send it direct to your stitchy chair. Give us a call at 410.296.0405 to register. It’s going to be a party! « Previous: It was a celebration! Ruth, Ruth, Ruth , Ruth, RUTH. You are killing me with awesome this year! LOVE THIS!!! Apparently I really, really miss you.